PowerApps에서 처음부터 앱을 빌드할 때 또는 기존 캔버스 앱에서 데이터 연결을 추가합니다.In PowerApps, add a data connection to an existing canvas app or to an app that you're building from scratch. 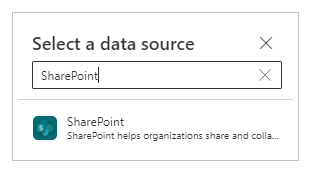 앱은 SharePoint, Salesforce, OneDrive 또는 다른 많은 데이터 원본에 연결할 수 있습니다.Your app can connect to SharePoint, Salesforce, OneDrive, or many other data sources. OneDrive에 연결하고 사용자 앱에서 Excel 통합 문서의 데이터를 관리합니다.Connect to OneDrive, and manage data in an Excel workbook in your app. Twilio에 연결하고 사용자 앱에서 SMS 메시지를 보냅니다.Connect to Twilio, and send an SMS message from your app. 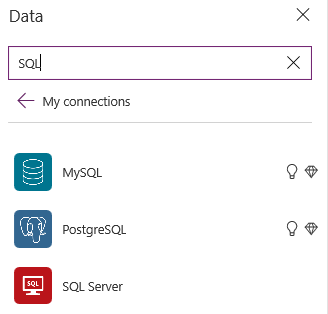 SQL Server에 연결하고 사용자 앱에서 테이블을 업데이트합니다.Connect to SQL Server, and update a table from your app. PowerApps에 등록한 다음, 등록에 사용한 동일한 자격 증명을 입력하여 로그인합니다.Sign up for PowerApps, and then sign in by providing the same credentials that you used to sign up. 홈 탭에서 빈 페이지의 캔버스 앱을 선택합니다.On the Home tab, select Canvas app from blank. 앱에 대한 이름을 지정하고 만들기를 선택합니다.Specify a name for your app, and then select Create. PowerApps Studio 시작 대화 상자에서 건너뛰기를 선택합니다.If the Welcome to PowerApps Studio dialog box appears, select Skip. 가운데 창에서 데이터 창을 열기 위해 데이터에 연결을 선택합니다.In the center pane, select connect to data to open the Data pane. 컨트롤이 화면에 이미 포함된 기존 앱에서는 동일한 창을 열기 위해 보기 > 데이터 원본을 선택합니다.If this were an existing app and the screen already contained a control, select View > Data sources to open the same pane. 데이터 원본 추가를 선택합니다.Select Add data source. 원하는 연결이 연결 목록에 포함되어 있으면, 앱에 추가하기 위해 선택합니다.If the list of connections includes the one that you want, select it to add it to the app. 그렇지 않은 경우 다음 단계로 건너뜁니다.Otherwise, skip to the next step. 연결의 목록을 표시하기 위해 새 연결을 선택합니다.Select New connection to display a list of connections. 검색 표시줄에 입력 또는 원하는 연결의 처음 몇 문자를 붙여 하 고 표시 되는 경우 연결을 선택 합니다.In the search bar, type or paste the first few letters of the connection you want, and then select the connection when it appears. 만들기를 선택하여 연결을 만들고 앱에 추가합니다.Select Create to both create the connection and add it to your app. Office 365 Outlook과 같은 일부 커넥터는 추가 단계가 필요하지 않으며 즉시 데이터를 표시할 수 있습니다.Some connectors, such as Office 365 Outlook, require no additional steps, and you can show data from them immediately. 다른 커넥터의 경우 자격 증명을 제공하고, 데이터의 특정 집합을 지정하거나 다른 단계를 수행하라는 메시지가 표시됩니다.Other connectors prompt you to provide credentials, specify a particular set of data, or perform other steps. 예를 들어 SharePoint 및 SQL Server는 사용하기 전에 추가 정보가 필요합니다.For example, SharePoint and SQL Server require additional information before you can use them. 앱을 업데이트하는 경우 갤러리, 양식 또는 다른 컨트롤에 표시되는 데이터의 원본을 식별하거나 변경해야 할 수 있습니다.If you're updating an app, you might need to identify or change the source of data that appears in a gallery, a form, or another control. 예를 들어, 다른 사람이 만든 앱을 업데이트 하거나 오래 전에 만든 데이터 원본을 식별 해야 합니다.For example, you might need to identify a data source as you update an app that someone else created or that you created long ago. 데이터 원본을 식별하거나 변경하려는 갤러리와 같은 컨트롤을 선택합니다.Select the control, such as a gallery, for which you want to identify or change the data source. 데이터 원본의 이름이 오른쪽 창의 속성 탭에 나타납니다.The name of the data source appears on the Properties tab of the right-hand pane. 데이터 원본에 대한 자세한 정보를 표시하거나 변경하려면 해당 이름 옆에 있는 아래쪽 화살표를 선택합니다.To show more information about the data source or to change it, select the down arrow next to its name. 현재 데이터 원본에 대한 자세한 정보가 표시되고, 다른 데이터 원본을 선택하거나 만들 수 있습니다.More information about the current data source appears, and you can select or create another source. 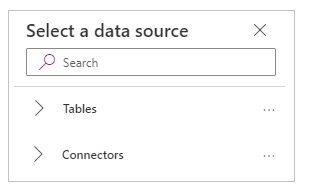 Excel, SharePoint 또는 SQL Server와 같은 원본에서 데이터를 표시하고 업데이트하려면 갤러리를 추가하고 폼을 추가합니다.To show and update data in a source such as Excel, SharePoint, or SQL Server, add a gallery, and add a form. 다른 원본에 있는 데이터의 경우, Office 365 Outlook, Twitter 및 Microsoft Translator에 대한 데이터와 같이 커넥터 특정 기능을 사용합니다.For data in other sources, use connector-specific functions such as those for Office 365 Outlook, Twitter, and Microsoft Translator.